This page discusses optimizations you can make to your DTO implementation, describes restrictions against overlaying the root node, and details how to configure compressed overlays in the DTBO image. It also provides sample implementation instructions and code. DTO cannot concatenate values from main DT and overlay DT, so you must put the kernel command line of the main DT in chosen/bootargs and the kernel command line of the overlay DT in chosen/bootargs_ext. Bootloader can then concatenate these locations and pass the result to the kernel. While the latest libfdt supports DTO, is it recommended to use libufdt to implement DTO (AOSP source at platform/system/libufdt). libufdt builds a real tree structure (un-flattened device tree, or ufdt) from the flattened device tree (FDT), so it can improve the merging of two .dtb files from O(N2) to O(N), where N is the number of nodes in the tree. In Google's internal testing, using libufdt on 2405 .dtb and 283 .dtbo DT nodes results in file sizes of 70,618 and 8,566 bytes after compilation. Compared with a DTO implementation ported from FreeBSD (124 ms runtime), libufdt DTO runtime is 10 ms.
libufdt is developed with some libfdt APIs and data structures. When using libufdt, you must include and link libfdt (however, in your code you can use the libfdt API to operate DTB or DTBO). The parameter main_fdt_header is the main DT and overlay_fdt is the buffer containing the contents of a .dtbo file. The return value is a new buffer containing the merged DT (or null in case of error). The merged DT is formated in FDT, which you can pass to the kernel when starting the kernel. The new buffer from the return value is created by dto_malloc(), which you should implement when porting libufdt into bootloader. For reference implementations, refer to sysdeps/libufdt_sysdeps_*.c. 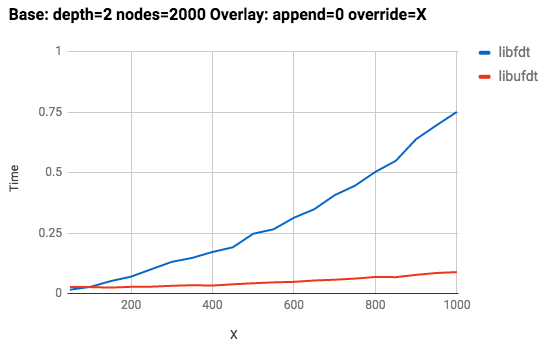 You cannot overlay a new node or property into the root node of main DT because overlay operations rely on labels. 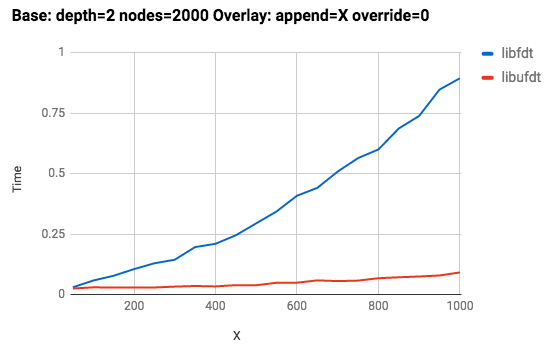 Because the main DT must define a label and the overlay DT assigns the nodes to be overlaid with labels, you cannot give a label for the root node (and therefore cannot overlay the root node). Android 9 adds support for using compressed overlays in the DTBO image when using version 1 of the device tree table header. When using DTBO header v1, the four least significant bits of the flags field in dt_table_entry indicate the compression format of the DT entry. Currently, zlib and gzip compressions are supported. Android 9 adds support for testing compressed overlays to the VtsFirmwareDtboVerification test to help you verify the correctness of overlay application. The following instructions walk you through a sample implementation of DTO with libufdt (sample code below).